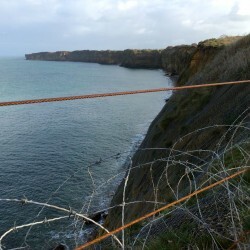 Our D-Day 70th anniversary exploration of Normandy landing sites led us to Pointe du Hoc and Omaha Beach where U.S. troops took heavy casualties to prevail against intense resistance. The first part of our D-Day 70th anniversary exploration had been spent at Utah Beach, and the villages of Sainte Marie du Mont and Sainte Mere Eglise, which had been liberated by paratroopers. 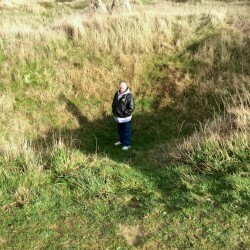 Now we turned to even bloodier battle sites: Pointe du Hoc and Omaha Beach. It seems as though the peaceful farms and lanes of the Norman countryside give way to the sea abruptly. 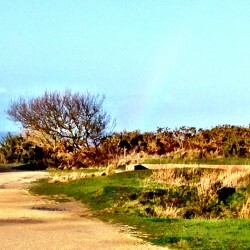 The horizon is flat, and the sea is rarely glimpsed until you’re quite upon it. 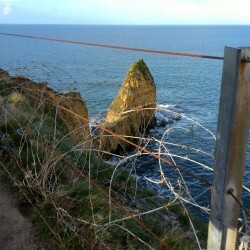 Pointe du Hoc is a high point between the Utah Beach and Omaha Beach D-Day landing sites. 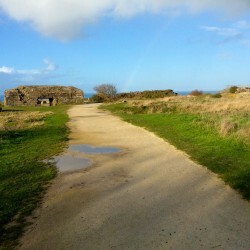 From this point, German positions had a commanding view of the coastline. Under heavy sea bombardment in April, two months prior, the Germans had removed the largest of the guns. Upgrades to their positions were underway: casements were being built to house additional 155mm cannons, which would seriously threaten invasive action. 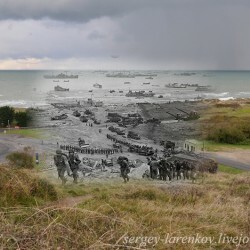 Any successful invasion strategy had to include a plan to destroy existing guns and empty casements along the coastline. 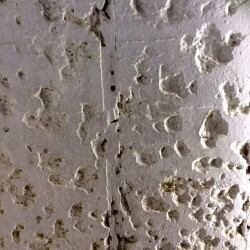 Today the area is still pockmarked by the heavy bombardment. 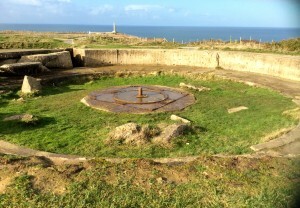 The bunkers and gun placements are fairly intact. 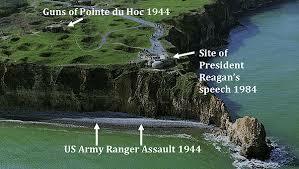 The taking of Pointe du Hoc by U.S. Army Rangers is a legendary assault. 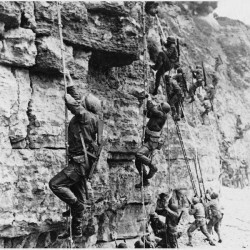 Scaled using rope, ladders and grappling hooks, the initial cliff area landings were marred by tragic setbacks, miscalculations (ladders too short, faulty coordinates), and malfunctioning equipment. 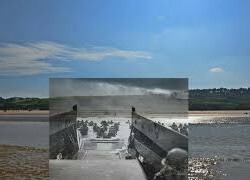 Once the 100 ft cliff was conquered, Rangers defended and repelled German attacks, joined by Rangers who had landed at Omaha Beach. Counter-attacks continued throughout June 7 and into June 8, when they were relieved by additional troops from Omaha. 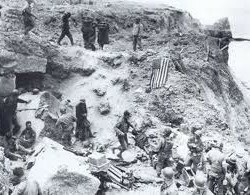 The initial landing’s Ranger unit, starting with more than 225 men, had 90 survivors. 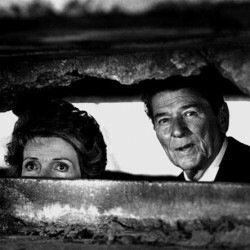 President Ronald Reagan made a legendary speech on the 40th anniversary of D-Day in 1984 here. 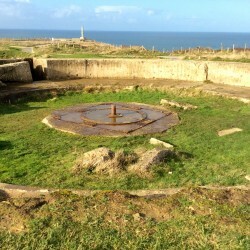 The vertical monument design reflects the daggers used by the Rangers to scale the cliff. 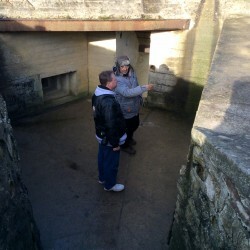 Our Normandy tour guide, Colin McGarry, chatted with Pete extensively about the gun emplacements and strategic elements that led to the assault plan. 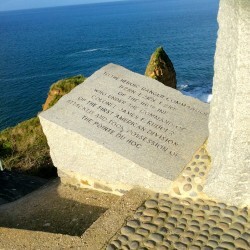 Scanning to the right as you look out to sea, Pointe du Hoc and Omaha Beach blend into one sightline. It is easy to imagine, yet hard to comprehend, the massive undertaking. Wikipedia tells us the Omaha foothold was the “most tenuous” of all the landing sites at the end of the day. 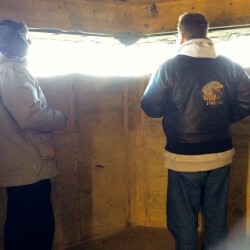 However, over the next two days, most of the initial invasion objectives were achieved. 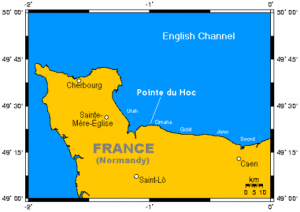 Allied positions began their advance inland. 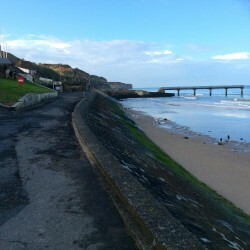 They were covered by a supply chain originating at Omaha out of prefabricated “Mulberry harbors” that had been towed across the English Channel and sunk to form a breakwater. Thirteen days later, the artificial harbor was destroyed by heavy storms. 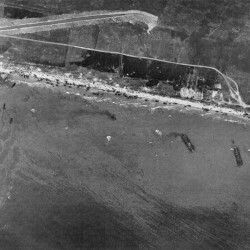 In the meantime, its operations had brought ashore 11,000 troops, 2,000 vehicles and 9,000 tons of equipment and supplies. 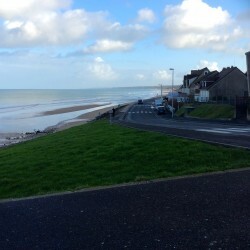 Today, Omaha Beach is a tranquil series of holiday communities. Remains of the artificial harbor can be seen at low tide, and defensive concrete bunkers punctuate the groups of vacation homes. 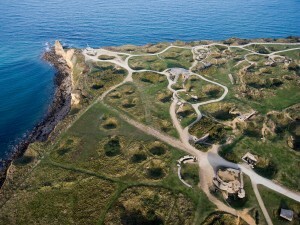 If you’re planning a visit to Pointe du Hoc and Omaha Beach, and/or other D-Day sites, we highly recommend Normandy tour guide Colin McGarry (read his 5-star reviews on Trip Advisor, here). Colin will meet you at the train station in Carentan with his car. The train from Paris St Lazare station to Carentan takes about 2-1/2 hours, details here. We had purchased a Global Eurail pass prior to this trip, which we used in place of separate train fare.